The V&A Waterfront is one of the most visited landmarks in Cape Town. The tastefully restored Victoria & Alfred Waterfront is one of Cape Town's main tourist attractions, and not just for the opportunity of having Table Mountain as the stunning backdrop to your holiday photographs. 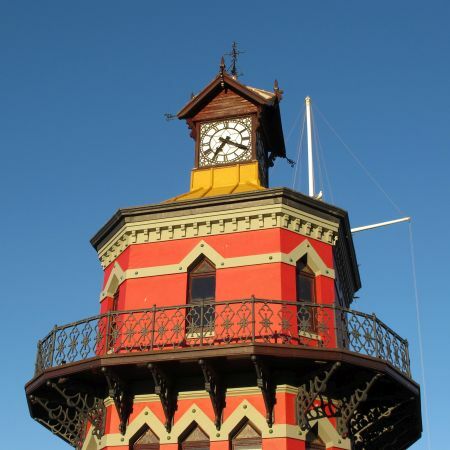 The original Victorian harbour was restored in the early 1900s, and today the Waterfront is a lively and buzzy place, as well as still being a working harbour. The many restaurants and bars dotted around the working harbour sides not only offer unbeatable views and fine dining, but are also wonderful places to sit and listen to the buskers entertaining the crowds with traditional African harmonies, watch the street entertainers and musicians playing to the crowds, or to simply enjoy the warm summer evenings and soak up the atmosphere. If you want to stay in the Waterfront, there is a wide selection of world-class hotels to choose from, including the prestigious Cape Grace, One & Only and the Table Bay Hotel, or for the more budget conscious, there is Southern Sun Waterfront and Protea Hotel Victoria Junction. The Two Oceans Aquarium features the marine life found in and around the Cape Peninsula, including tropical and commercial fish, penguins, seals and sharks. Highlights include the kelp forest, diving in the shark tanks, and the 'touch' pool. Another attraction is the Cape Wheel, which offers 360 degree views of the V&A Waterfront and the mountain. Take a trip at sunset for some awesome sights! And if you miss your photo opportunity on the first go round, don't panic, the Wheel takes you on a 12-15 minute ride and goes round 4 times in total. Robben Island, just off the coast of Cape Town, is a boat ride across the Bay from the V&A Waterfront, and is famous for its history as a place of exile, banishment, isolation and imprisonment. Several operators offer daytime and sunset cruises around Table Bay, or scenic helicopter 'flips' across the city and Table Mountain, and can be booked on the quayside if the whim takes you when you are there. The Waterfront caters for all your shopping needs - everything from designer clothing to hand-painted ostrich eggs. The Watershed, one of the largest craft markets in South Africa, is filled with an eclectic mix of handmade merchandise and art, and features a diverse assortment of innovative designs and traditional crafts, antiquities and holistic lifestyle accessories. But for the serious shoppers, there is only one place to go. The Victoria Wharf Shopping Centre is a haven of over 400 speciality shops, major retail outlets, curio stores and craft barrows. There are also over 70 restaurants, coffee shops and fast food outlets. A shopaholic will be pleased to know that, as well as being able to shop here 7 days a week until 9 pm in the evening, as a tourist it is possible to claim back any VAT on non-consumable goods that are purchased, as long as a valid receipt can be produced. The PortsWood offers a choice of Standard Rooms, Deluxe Rooms and Suites. There is also a swimming pool for guest's enjoyment - ideal for relaxing by and sipping a cocktail after a day exploring the sights of Cape Town. Nestled between the majesty of Table Mountain and the Atlantic Ocean, the Southern Sun Waterfront Cape Town is ideally situated within easy walking distance to the popular V&A Waterfront. The well-appointed guest rooms are all designed with quality and comfort in mind, with air-conditioning, satellite TV, telephone and tea/coffee making facilities. The 410 elegant and spacious hotel rooms all boast spectacular views over the many aspects of Cape Town - enjoy either the view of Table Mountain, the bustling Table Bay Harbor and Waterfront or the city centre. Rooms are lavishly decorated with rich finishes and furnishings, and all offer luxurious private bathrooms and in room amenities to enhance your stay and make it as comfortable as possible. The Radisson Red is set in the V&A Waterfront area and offers a hip hotel choice with views of Table Mountain only moments away from a wide range of bars, restaurants and shops. Nestled in the heart of Cape Town Marina in the V&A Waterfront lies the beautiful and modern Lawhill Luxury Apartments. The apartments offer 5* accommodation at an affordable rate. The Commodore offers 236 elegantly furnished standard rooms and suites. All rooms have air-conditioning.